Trigger warning: Embers contains a brief scene depicting a sexual assault and a sequence involving suicidal ideation. 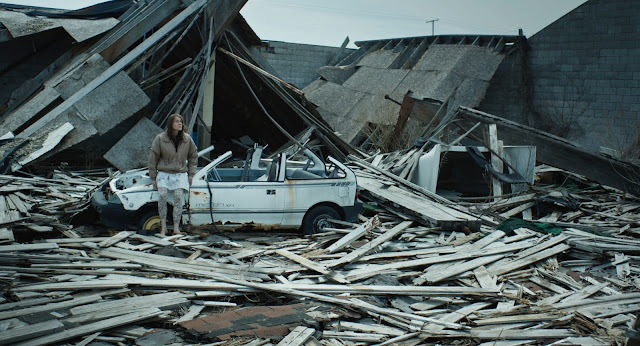 Embers, the impressive debut feature film by Claire Carré, is probably best described as a "slice-of-life" post-apocalyptic collection of five intertwining stories scattered across the globe. Embers follows nine characters in the wake of a mysterious virus in the near future, which has robbed humanity of the ability not only to hold on to their memories, but to create new memories as well. While much apocalyptic and/or dystopian media combines the futuristic and/or wasteland-inspired aesthetic with a large-scale social critique, often centering on the consequences and implications of ever-widening class divides (The Hunger Games, Elysium) and their effects on humanity/industry/the environment (Snowpiercer), Embers takes a much more personalized, intimate look at the aftermath of destruction, and uses the loss of memory as a device to examine and question what makes a person a person. How much of who we are is formed by our lived experiences and memories, and how much of our identity is inherent to ourselves? Can we grow as people if we cannot remember who we were before? The five segments of the movie are interspersed, creating if not a cohesive narrative, then a series of contrasts and comparisons of how each character deals with living in this post-disaster world. In the first section, "Love," Guy (Jason Ritter) and Girl (Iva Gocheva) awake in a crumbling apartment building together on a mattress with no memory of themselves or of one another. After discovering that they are wearing matching bracelets, they surmise that before they contracted the virus they must have wanted to stay together, and slowly fall in love all over again as they wander through their abandoned landscape. "Family" follows the Boy (Silvan Friedman), a small, hardy child who has seemingly forgotten how to speak, as he makes his meandering way through forests and fields in search of a home. "Morality" follows a teenage boy (Karl Glusman) whose response to the devastation of his city manifests as rage and violence. In "Learning," the most introspective and self-referential of the vignettes, a former academic (Tucker Smallwood) seeks to reclaim the knowledge he has lost due to the virus, using books on memory and the brain in search of a cure. Lastly, "Freedom" takes place away from the ravaged world in a containment bunker hidden deep underground, where Miranda Sandoval (Greta Fernández) and her father (Roberto Cots) have escaped the virus and live a life of relative luxury. They have maintained their memories and identities, but, as Miranda comes to decide, that is not enough--living with only one another in a silent bunker is no way to live at all. The imagery of Embers is by far its best quality--it is undoubtedly a beautifully shot film (shot on an Alexa camera), combining a heavy emphasis on close-ups of the actors' faces with wide, textured visuals of the utter chaos and destruction surrounding the survivors. The production values are marvelous: each location, be it the smooth gray concrete walls of the bunker or the exquisitely peeling paint of the disheveled abandoned homes, is perfectly calibrated to evoke the mood of each segment. The emotional peak of the "Love" storyline is jaw-dropping, in which Guy and Girl find a church in shambles and bask in changes of light through stained-glass windows while watching one another. It is the most vivid and wondrous image I've seen in a film in a long, long time, and gives the lovers a moment of respite and a brief promise of hope. Elsewhere in Embers, the mise-en-scène is used to chilling, haunted effect: the Boy meets a woman (Dominique Swain) living alone in a house full of candy and stuffed animals who, thanks to the virus, has been reduced emotionally and intellectually to a kindergartener. After promising he'll be happy with her, covering the Boy in stuffed animals and telling him a simple story about finding the people who have gone missing, she proceeds to lock him in her room, forcing him to escape through a window. One of the most striking visual aspects of Embers is simple but effective in engaging the audience in the jarringly different locations: the camerawork of the surface world storylines is jittery and off-kilter, almost to a fault, while shots in the bunker are symmetrical, clean, and static, contrasting the danger of the outside with the staid environment of the containment center, the regularity and sedateness of which reflects a key plot point later on in the film. Because Embers has no central plot and, according to the filmmakers, an intentional avoidance of a moment of collective catharsis, the success of the film must rest largely on to the performances of the actors. For the most part the acting works, with Iva Gocheva's shy, endearing Girl, Silvan Friedman's wordless Boy, and Greta Fernández's listless, angry Miranda representing the cream of the crop. The Boy's innocent non-reaction to witnessing a murder, with little to no understanding of what death means, is incredibly affecting even though not one tear is shed or cry is uttered in mourning, proving that sometimes, less is more in terms of performance. Later on in the film, the warmth of the interactions between the Teacher and the Boy allows Embers to retain a bright spot of joy amidst the sickening knowledge that eventually all of these characters we've come to know over the course of the film will lose any memories they make. As the Girl and Guy realize after consummating their newfound love in the church, once the characters fall asleep, they will essentially be reset to who they were the previous day, and will have to create and recreate their connection over and over again. The Boy will never learn how to speak, the Teacher will continue to forget, the teenage boy will continue to suffer and not fully understand why, and Miranda will, through her own devices, fall prey to the same fate as the rest. On the less positive side, the world-building, so important in dystopian and post-apocalyptic films, is a little thin. The audience never learns what caused the virus, how it spreads, or how long it has been ravaging the world, and we also never learn why the cities are emptied of people but devoid of corpses, as we might realistically expect. Yet because Embers deliberately turns its focus away from societal mechanisms and the larger ecosystems affected by the virus and focuses in so detailed a manner on the human impact, right down to the individual, this lack of context is forgivable. Additionally, the interior of the bunker falls prey to some of the clichés of post-apocalyptic aesthetics. Miranda's underground life involves the use of sophisticated technology to maintain her memories, Miranda and her father eat solidly-colored futuristic foodstuffs, and the architecture and design of the bunker itself looks like something out of a German or Scandinavian lifestyle catalogue combined with a contemporary art gallery: all gray walls, sleek white cubes and simple but elegant garments in solid, muted shades. The notable exception is the airy, light-filled auditorium with its round skylight, as it is the only place in the bunker (one assumes) where the inhabitants can see natural light and experience some trace of the world they've lost in the name of survival. I caught Embers on the last night of its limited Los Angeles run at the ArcLight in Hollywood. The film screening was followed by a short panel with Carré, Charles Spano (who cowrote the film with Carré), and production designer Chelsea Oliver. The story of the film's inception represents the best of the possibilities for independent media in the crowdfunding landscape, as the film is incredibly accomplished for a debut feature. Written in 2012 and filmed in three rounds, with each round crowdfunded by a separate campaign, Embers was also edited as it was filmed by Carré and manages to present a unified, cohesive vision despite the three years it took to finance and assemble. Embers' path through the film festival circuit is nothing short of miraculous, as Carré, Spano, and discussion moderator Stephen Elliot (of Adderall Diaries fame) stressed during the panel, since films that actually pay the submission fees to enter film festivals often don't see much success. 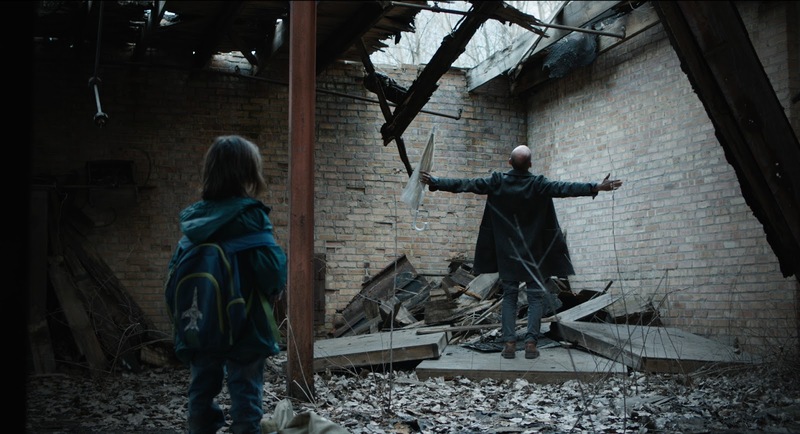 Yet Embers has rightfully been honored for its creativity and maturity by both festival juries and critics alike, with IndieWire calling it "the best science fiction discovery of the year." Well, here is another critic throwing her hat in the ring in favor of Embers. The film is both imaginative and disciplined, measured and visionary, and bodes well not only for sci-fi films in general, but also for the continuation of independent media, the potential of crowdfunding, and the promise of young auteurs such as Carré. I will be awaiting her follow-up film with bated breath.